This is a collection of over 17,000 photographs taken over the past fifty years by Hedley Grenfell-Banks. They cover towns and villages in every region of France except Corsica, and most Départements. Some of them are scans of very old transparencies, so their quality is not wonderful. More recent ones , taken with digital cameras, are more acceptable. 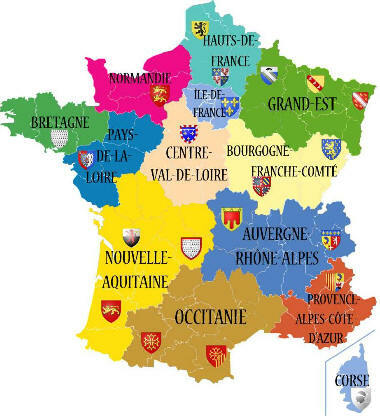 France is divided into 13 regions, and each region includes several Départements. To see which Départements fit into each region, click on the name of the region in the list below. From there, you can click on each Département to find pictures of individual towns and villages. If there is no link to a Département, that's because I haven't visited it yet. look in the global index.